When the Euro coins were first unveiled, right after the turn of the millennium, the entire series of several different countries faded away as part of the old order. One of the founding members and users of the new Euros, Spain saw its pesetas disappear into the new wave of commerce that is a unified Europe. 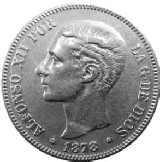 But its 5 peseta coin, once a piece to rival a silver dollar, had been fading for more than a century. It’s interesting to trace a big, silver disk like this, and to see the changes that time and a changing economy forced upon it. The Spanish system of 100 centimos equaling 1 peseta isn’t a particularly old one. Called the “Third Decimal Coinage,” by the Krause Standard Catalog of World Coins, the peseta had been preceded by two other decimal systems, and both of those were successors to a system in which 34 maravedis equaled 1 silver real, and 16 reales equaled one gold escudo. All in all, that earliest system probably was begging for some kind of simplification – after all, it took 544 maravedis to make an escudo. Not the most convenient unit to divide neatly. 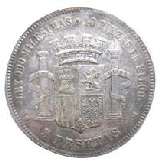 By the time the third decimal coinage of Spain was unveiled, in 1869, the peseta was a silver coin about the size of a U.S. quarter, while the 5 peseta was the reigning big shot of the Spanish silver coinage. It came in at 25 grams, had 0.7234 ounces of actual silver in it, and was 0.900 fine. By comparison, our Morgan silver dollars were 26.73 grams, had 0.77344 ounces of silver in them, and were also 0.900 fine. 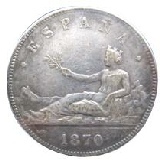 A bit like the Morgan dollar in the use of symbols, the Spanish 5 pesetas first issued in 1869 showed a reclining figure of a woman on the obverse, most likely symbolic of Spain itself. The reverse is dominated by the complex shield that so many collectors of Mexican and Spanish colonial coinage recognize, at least to some extent. The shield is divided into four quarters, with a tiny, fifth part between the bottom two. The symbols and designs in these five portions stand for the Houses of Castile, Leon, Navarre, Aragon, and (the little one) Granada. Sometimes a small set of fleur de lis are centered on the shield, symbolic of the House of Bourbon, although by 1869 this wasn’t used. Above the entire shield is the royal crown, and flanking are the two pillars of Hercules. These, “reclining figure,” 5 pesetas were issued only in 1869 and 1870, making them a very short series if you choose to collect them today. 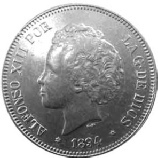 By 1871 the Spanish king was on the obverse, where one monarch or another would remain until 1899. That Bourbon center to the royal shield also was restored to the center of the reverse shield. While it’s only a little piece of history today, it symbolized the restored monarch’s ancestral connection with France. King Alfonso XII was able to make that claim. There are seven royal heads a person could collect today, if he or she wanted to go for type coins in a 5 peseta series, and not bother about each and every date. They are relatively common, and should be available to a patient collector who searches through the dealers’ stocks at some MSNS show. In a higher, but still circulated grade, each of these pieces will cost a bit more than the value of their silver bullion. Of course, if you find one with a gorgeous mint state luster to it, the price tag rises. While the Spanish monarchy continued in a generally uninterrupted line until 1931, there really are no 5 peseta pieces after those of 1899, which sport the image of a young Alfonso XIII. Apparently, other denominations did the work of everyday business in Spain during those decades. As for the 1930’s, well, that entire decade was one of civil war in Spain, with victory going to a man, Francisco Franco, who can lay claim to being the longest living fascist leader in the world. In his civil war he enlisted the aid of German allies, and in the process helped hone the young Nazi Luftwaffe into a terrifying war machine. He was wise enough to maintain neutrality for Spain throughout the Second World War, even though Nazi occupied France became Spain’s northern border. And when Hitler and Mussolini passed into history, the Spanish dictator remained firmly in power – for thirty more years. 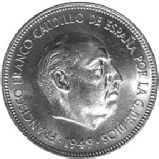 It’s no surprise then that the next 5 peseta coins of Spain bore the face of Generalissimo Franco on the obverse. All dated 1949, despite being produced for three years, they are made of nickel, and sport a modified Spanish coat of arms on the reverse. Apparently, the General wanted his connection to the past, ruling house of Spain to be well established. 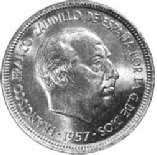 It was 1957 that saw the next issue of the 5 peseta coin, and this time not only the precious metal was gone, but the large size had diminished as well. These copper-nickel coins are about the size of a U.S. quarter, but continue to show the face of the Generalissimo. While they were issued for roughly two decades, these pieces also all bear the one date. By any standard, both of these five peseta pieces are common coins, with the 1957’s often turning up in dealer bargain boxes. There were proofs issued as early as 1972, which are perhaps obviously harder to find, and a bit more costly. Almost immediately upon Franco’s death in 1975, King Juan Carlos I assumed the title and rule of Spain. Franco supporters were now in retreat, and for those who had been brave enough to resist that regime, the long night was over. Spanish 5 peseta coins were now issued with the new king prominently on the obverse, the same design as on all the larger denomination Spanish coins. This new design saw no change in composition from the old pieces, and indeed, stayed the same until 1989. That year saw yet another diminishing of the 5 peseta, to a small, aluminum-bronze piece. Now, the King’s face was gone, replaced by a rather stylized design. The last gasp of the 5 peseta, before all Spanish coins were folded into the Euros, were the small, nickel-brass pieces – and the aluminum-bronze pieces – of the 1990’s, many of which were actually used as a commemorative platform for regions of Spain. By now, these tiny wafers had almost no purchasing power. They too can be found in dealer bargain bins at almost any major show. 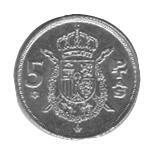 It was a long, downhill ride for the Spanish 5 peseta coin. Taking more than a century, these coins went from being the “crown” silver coin of their nation to being an almost forgotten piece of small change. But all that history makes for some great collecting today. If you get a chance, why not give these pesetas a try? Editor’s note: By the time the Peseta was replaced by the Euro, the 1 Peseta was the smallest circulating denomination. 5 Pesetas was worth about 3 Euro cents.